Where can you admire this statue and what is it to see? 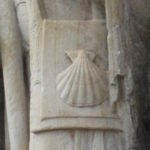 This Saint James can be seen in Santa Marta de Tera, a village next to the rio Tera at the beginning of the Camino Sanabrés, about 185 miles away from Santiago. Don’t judge this hamlet by its apparent modesty, as it is home of much more than the 200 souls living there. Santa Marta’s church is in fact a jewel of Romanesque architecture. 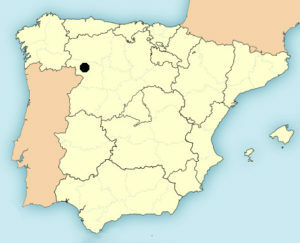 It is the last remain of a monastery built in the 10th century, one that is the oldest of its age in the province of Zamora. 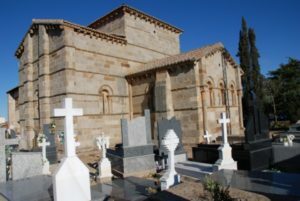 Its past and its architectural details make it a building of great historical and artistic value: it has now been registered among the cultural heritage sites of Spain. The church is also know for its natural light phenomena: on the days of the spring and fall equinoxes, a capital representing the Christ is illuminated by the men-focused rays of the sun. 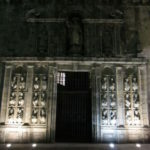 As for Santa Marta’s Santiago, he can be seen today outside the church, in an alcove on the west pillar of the portal that frames the main entrance of the building, on the southern frontage. The statue’s original place is unknown, even if some theorize that it was in the past the same it is filling today. 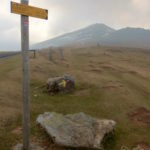 What is certain is that in-between, saint James lived on higher grounds for quite a while. He in fact decorated the belfry for a long time, before is was taken down in 1931 during the restorations that followed the church registration as a national historical monument. With a height of about 4 feet when it was whole, the statue suffered some damages that led it to break at the level of the saint’s knees. It also was decorated once with an inscription that read “James the Apostle” that faded away with time. Just like a treasure inside a treasure, Santa Marta’s statue of Saint James has its own historical and artistic value. There are many unknown data about it (like e.g. 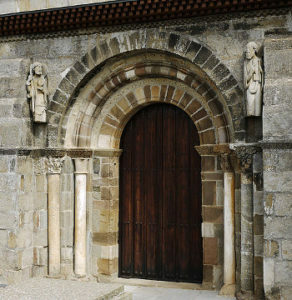 who sculpted it), but it still remains a major piece of Spanish Romanesque art and a very unique and original representation of the saint. 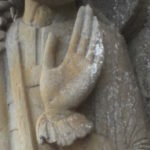 It is very often considered the first sculpture ever made of saint James in History (although this theory is impossible to assess, as leaving exact dating wasn’t exactly the ancient builders’ forte…). Studying this statue with the historical context of its creation in mind gives it a capital importance among Saint James’ iconographic tradition. 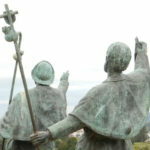 Some think the presence of the statue in Santa Marta is a sign of Saint James and Santiago de Compostela’s growing popularity in the 12th century Spain. 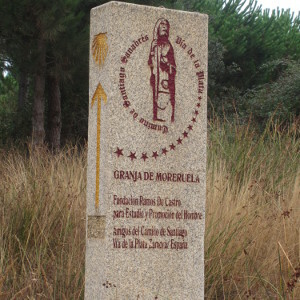 Experts agree to say the statue was made close-by: this leads to the hypothesis that, because Santa Marta isn’t on a main road leading to Galicia, the presence of Saint James’ statue there is a proof of the integration of its cults into the Iberian back country. 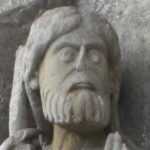 Others suggest otherwise: they consider Saint James was only one of a set of 12 statues that depicted the 12 apostles, from which only 2 others were recovered: Judas Thaddeus, now perched on the northern portal of the church, and an unknown apostle facing Saint James from the other pillar of the southern portal. With no certainty about it, this mysterious apostle is often referred to as Saint Peter. Although it’s not really relevant since no one knows where the statues were originally set, having the 2 Saint in symmetrical positions gives Saint James a lot of advantages. As for religious and architectural iconography, it conveys the fact that both are equal in the Saints and Apostles’ hierarchy. 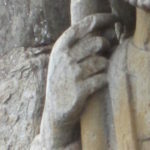 Eventually, the most interesting feature of this statue is its look, as it displays a shift in the perception of Saint James at the time it was created. Before the 12th century, he was perceived and pictured as an Apostle of the Christ and a preacher. His clothes and his attitude frozen in stone recall these identities: a fancy and elegant tunic, his face and left hand stretched in an energetic preach. 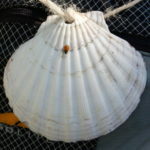 In addition to these classic features for its time, Santa Marta’s Santiago is also given the attributes of a pilgrim: a staff, a pouch and a scallop. A very unusual depiction for this Apostle and a mixture of attributes that makes the originality of this very statue. 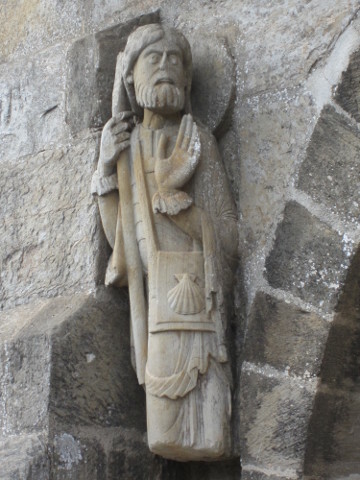 From the 12th century on, Saint James will slowly become a “pilgrim of his own shrine”; a representation that has become very traditional for him. Santiago of Santa Marta therefore fulfill both the functions of a preacher (guide crowds to salvation; preserve them from demons (as expressed by his risen left hand); urge them to hurry (pressing expressive face)) and of a pilgrim (rely on God only (small pouch); lean on the Holly Trinity to defend himself from dark forces (staff); be charitable (scallop)). 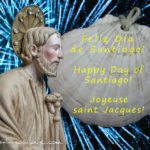 Santiago of Santa Marta thus has the double duty of guide and protector of the souls moving toward salvation. 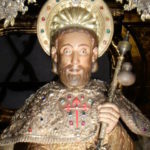 The cultural importance of the Santiago of Santa Mart and the rebirth of Saint James’ tradition in the 20th century made this statue one of the most advertised representation of the Apostle. 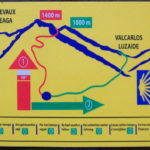 It is naturally the pilgrim’s passport’s stamp of Santa Marta de Tera, but also the symbol of the Camino Sanabrés (which can be seen on the Way). 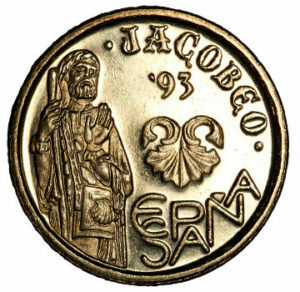 The jubilee of 1993 particularly helped to make the statue famous, as it was engraved on the 5 pesetas coins this very year. Quite an opportunity to spread this picture and pay it the tribute it deserves! And you? 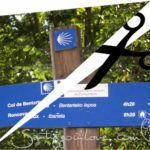 Did you visit Santa Marta de Tera, its church and its unique Santiago?